FINISH: Return to Saas Almagell or descend north to the Hohsaas Lift and Saas Grund. 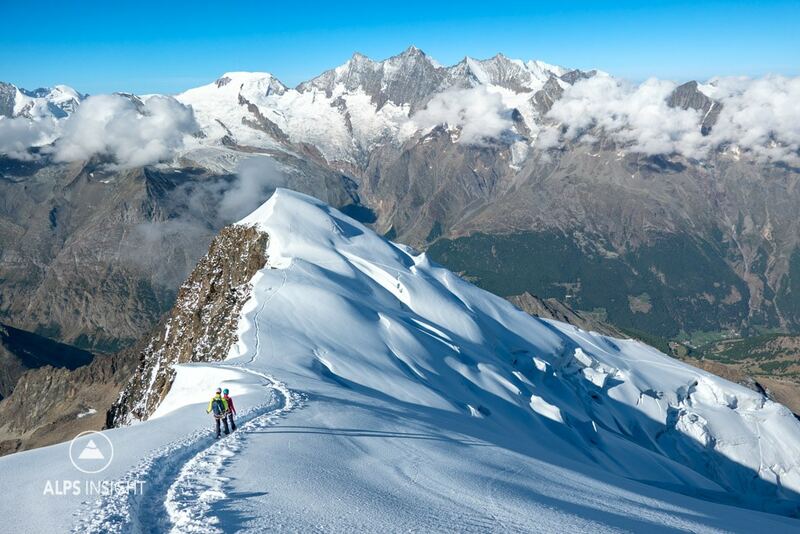 The southeast ridge of the 4017 meter Weissmies is without a doubt one of the best entry level alpine ridges in the Alps. 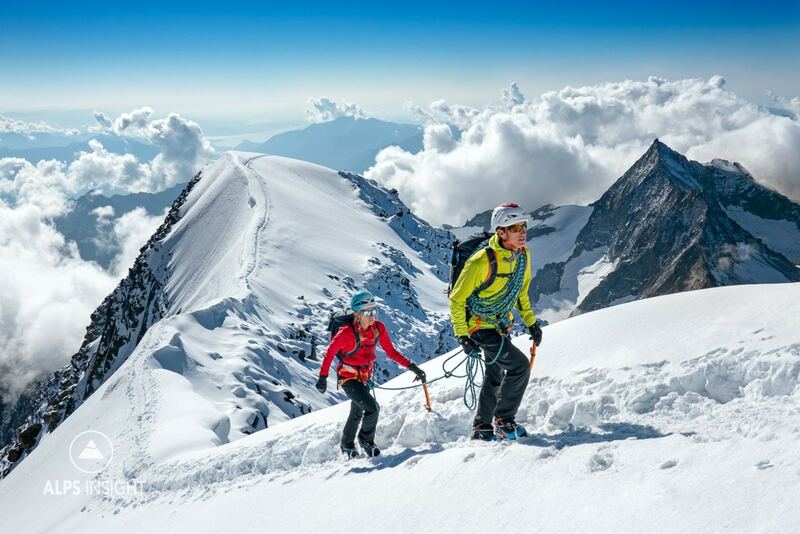 Not only this, but combine it with a descent of the normal glacier route on the north side and aspiring alpine climbers have a full experience of both quality rock ridge climbing with a moderately intricate glacier descent. The tour starts in Saas Almagell where signs are followed to the Almagellerhütte. This is a relatively big hut approach with about 1300 meters of vertical. Every experienced Alps climber knows to check the trail departing the hut for the route the night before. This is to avoid confusion and stumbling around with headlamps on in the pre-dawn darkness searching for the right climber's path. At the Almageller Hut, the popularity of this route is immediately apparent thanks to glow in the dark trail markers defining the way, all the way in fact, to the Zwischbergenpass at 3270 meters. Here the route begins, and you have an option. 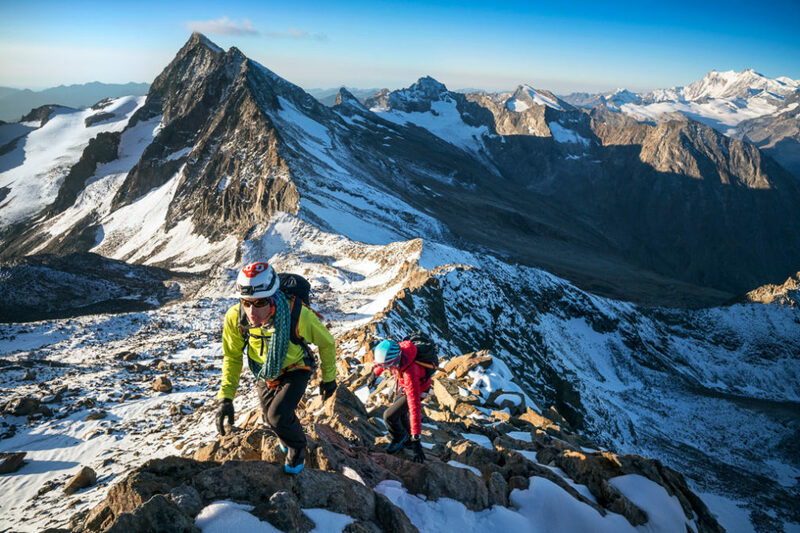 Immediately gain the ridge and stay close to its crest the entire way (UIAA II), or if snow covers the ridge, you can stay below it on the east side and simply hike up snow ramps until you are forced to gain the ridge at some point (easier). At around point 3972 meters, the rock ends on a snowy ridge line with one final rocky step to pass before the summit. 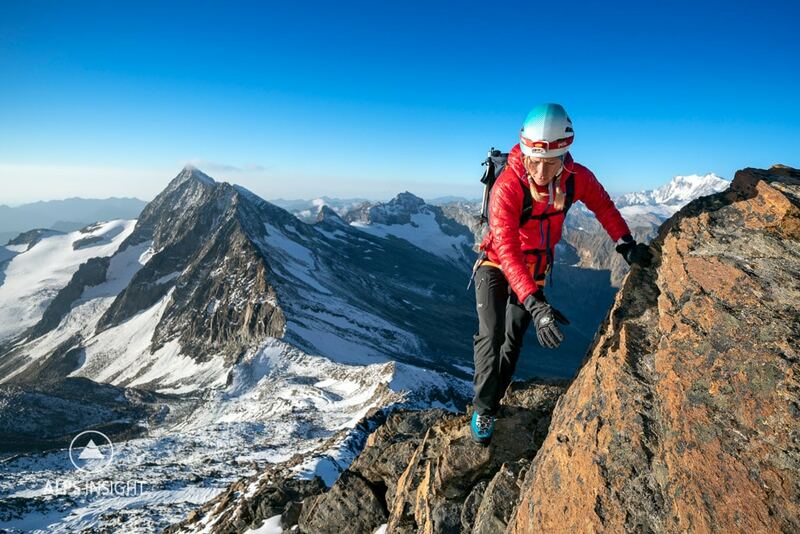 The descent can be either the same way you came up, or by descending the normal route which drops off the summit on the west ridge before veering north onto the Triftgletscher. The descent north is an entirely different experience from the southeast ridge as it is 100% glacier travel in crevassed terrain. The advnatrge to descending off the north side is that the Hohsaas lift can be taken all the way to Saas Grund, saving your legs almost 1600 meters of down. But, you will need to have already decided on this option when you start as glacier travel/crevasse rescue gear must be carried. Overall, this is a fantastic experience for entry level alpine climbers or for those testing out their bodies at higher elevations. If you do opt to descend to the Hohsaas lift, you might also consider spending the night and the next day climbing the Wessmies' neighbor, the 4010 meter Lagginhorn. 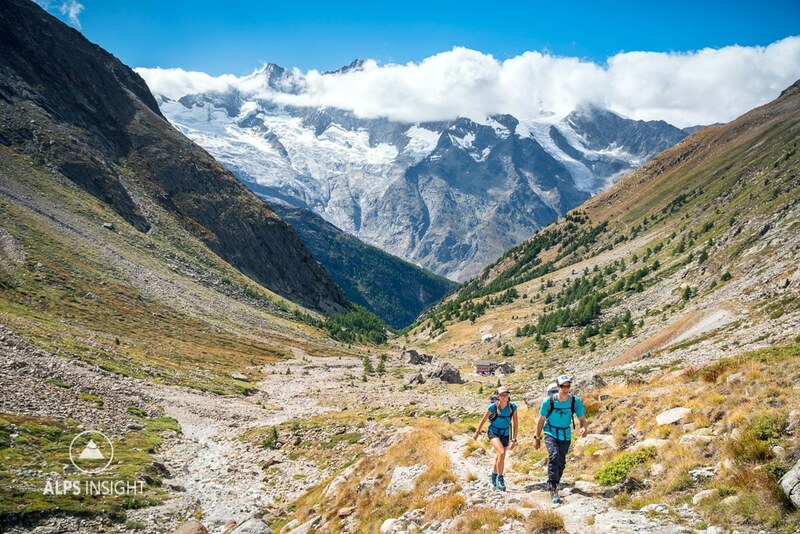 Finally, for experienced Alps' mountain runners, the southeast ridge of the Weissmies, in dry conditions, makes for an ideal big day round trip from Saas Almagell. And while you're in the neighborhood, the Lagginhorn, also 4000 meters, is a classic big mountain run when in condition. More info on our Elevation Lagginhorn page. 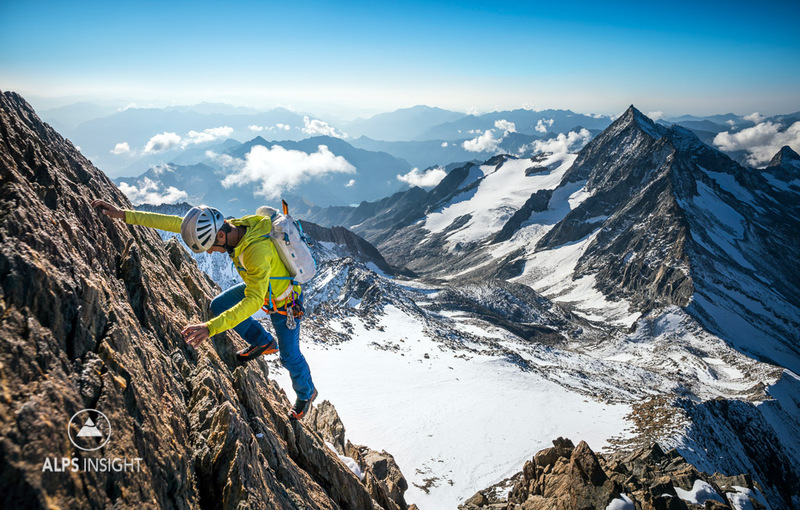 Interested in doing this route with a UIAGM Mountain Guide? Check in with Simon Duverney at AltiPlanet for more info. Simon is a great friend of the team at ALPSinsight. The long, but gorgeous, approach to the Almageller Hut. An early start from the hut gets you on the ridge at the Zwischbergenpass before sunrise. 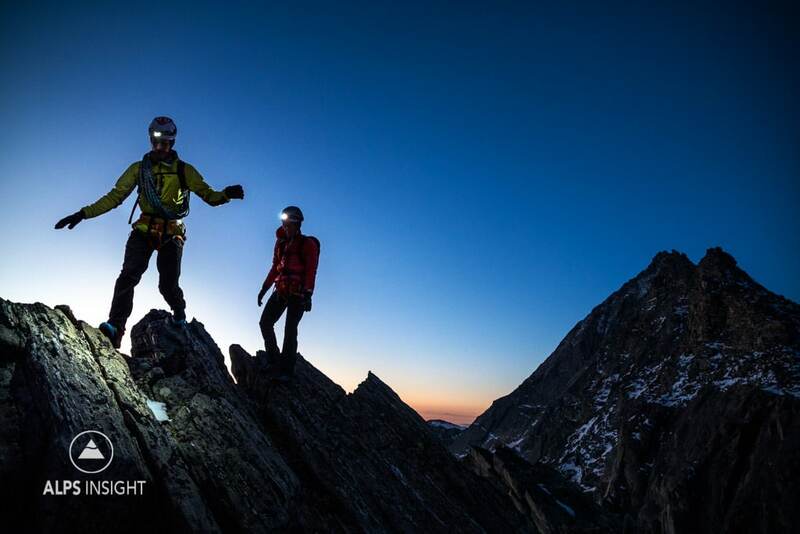 You'll want to be high on the route to get the full impact of sunrise in the Alps. Cruising quality rock on the southeast ridge. The ridge has some steeper steps of UIAA II, real climbing in a big landscape. At point 3972 meters, the rocky southeast ridge turns to a snow ridge, which is followed to the summit. Descending west off the summit en route to the Triftgletscher normal route. The track can be seen on the far right side of the image. 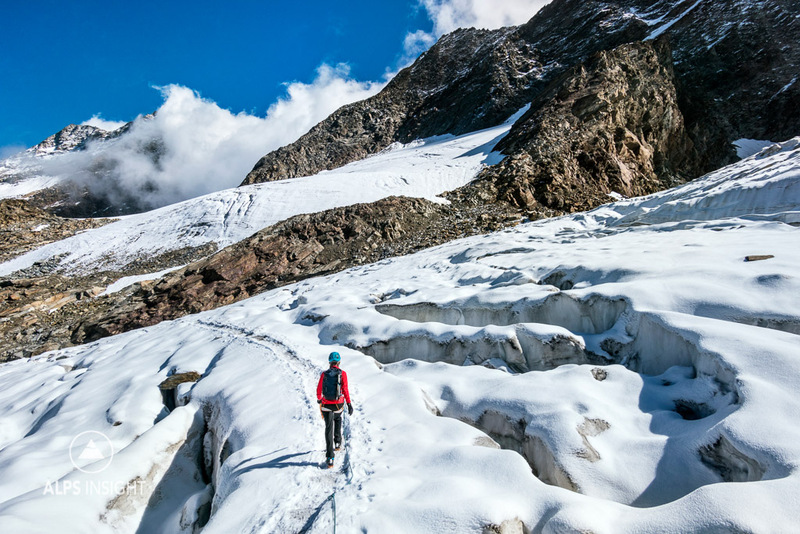 The final section of the Triftgletscher is a maze of crevasses.